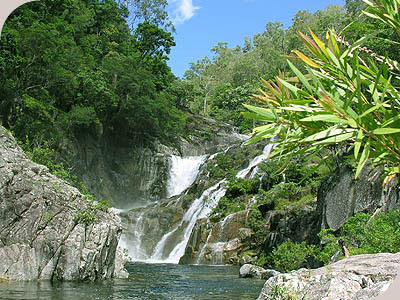 Behana Gorge is about 30 minutes drive south of Cairns, and well worth a visit if you have your own transport. Head south from Cairns on the Bruce Highway past Gordonvale. 5km past the turn-off onto Gillies Highway (there is a Caltex petrol station at this intersection) turn right onto Behana Gorge Rd. This long access road will take you past cane fields and finally into a carpark at the end. You will see a walking track running along a large water pipe. Take this track. The Behana Gorge walk takes about 45 minutes each way, and you will need to possess moderate fitness to complete some of the hilly climbs. Do not be put off by this, however, as this walk will lead you past swimming holes, breathtaking views over rapidly raging water and finally to a stunning waterfall running into a deep granite gorge. Behana Gorge actually supplies the town’s water and is always running, even in the dry season. Take your swimmers, as paddling in the crisp cool waters of the waterfall is a must. At the end of the walk there is an ideal area to have lunch and great rocks to jump off.